Glenn Brown usually transforms the painterly effects of already famous artists into the two-dimensional flatness of the mediated image. Here, he juxtaposes the drama of Victorian genre painting (showing alongside his work two etchings by John Martin) with a reworking of a Chris Foss apocalyptic illustration and reveals the way technical artistic skills lives on in areas outside the boundaries of the avant-garde. Morgan Doyle has surrounded himself with crated up artworks in suspended animation between creation, exhibition, and sale. Doyle is part-archivist, part-sculptor, part-caretaker, part-performer. He will be present at all times during the exhibition, as worker, access point and foil to the viewer. Jonathan Parsons challenges our reading of symbols and official representations. 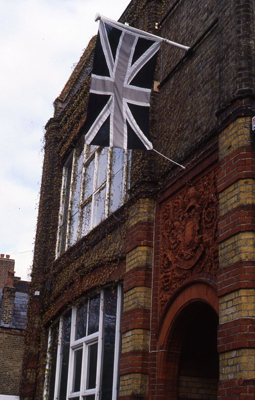 At Edwardes Square, he flies a flag and relates them to their histories, questioning the relationship between colour, shape and political/social meaning. His pieces lies beyond the fixed realm of the art space: outside, above the coat of arms. João Penalva uses a long series of documents to recall the densely hung quality of a Victorian interior, weaving visual representations of facts, statistics and narratives, picking at the web of “gentlemanly” secrecy which surrounds art dealing and practice. 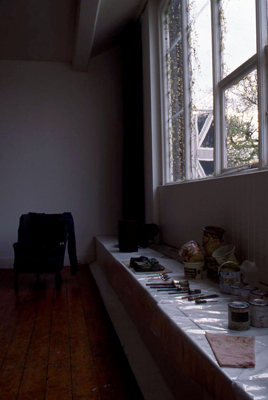 Mark Wallinger confronts the working space of the last artist who used these studios: the late Derek Jarman. 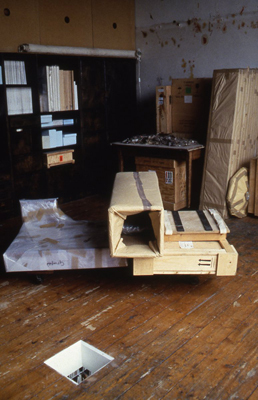 Without touching at the order of the studio (leaving Derek Jarman’s unpainted canvases, brushes, paint cans, and overall where he left them just before he died) Mark Wallinger’s piano piece is an elegy to the creative impulse and admits feeling through respectful emotion distance. 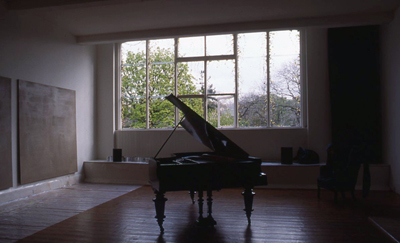 The music heard is the recording of the tuning of the now silent piano. Nicole Ward-Jouve, writer and critical theorist, professor of English Literature at the University of York, has written a short piece of fiction, entitled The House Where Salmon Perched. This Rear Window publication is a challenging reverie that explores the many layers that time leaves over the familiar and estranged objects housed in Edwardes Square. 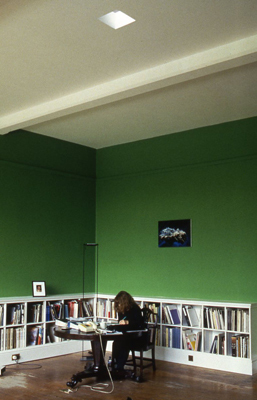 The exhibition Every Now & Then is accompanied by a symposium Writing Art on Monday 11 April 1994 at the Central Library, Phillimore Walk, London W8. This collaboration between Rear Window and The Kent Institute of Art and Design is aimed to launch the new MA course entitled Art Criticism and Theory. It stages the possibility of writing art in the 1990s. Participants in this symposium include Marjorie Allthorpe-Guyton, Andrew Benjamin, Guy Brett and Martha Fleming.